NASA is on the hunt for an asteroid to capture with a robotic spacecraft, redirect to a stable orbit around the moon, and send astronauts to study in the 2020s -- all on the agency's human Path to Mars. Agency officials announced on Thursday recent progress to identify candidate asteroids for its Asteroid Redirect Mission (ARM), increase public participation in the search for asteroids, and advance the mission's design. This image of asteroid 2011 MD was taken by NASA's Spitzer Space Telescope in Feb. 2014, over a period of 20 hours. 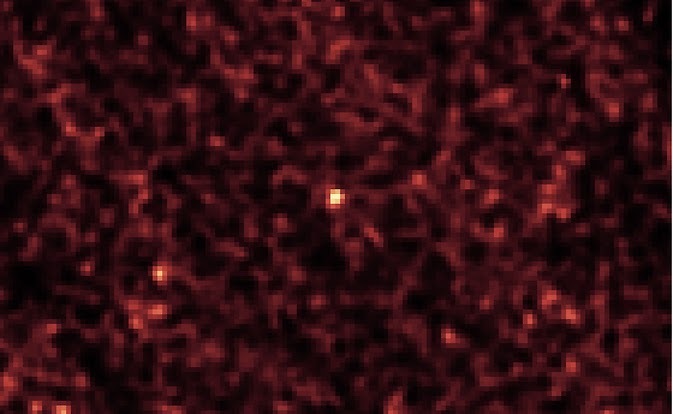 The long observation, taken in infrared light, was needed to pick up the faint signature of the small asteroid (center of frame). 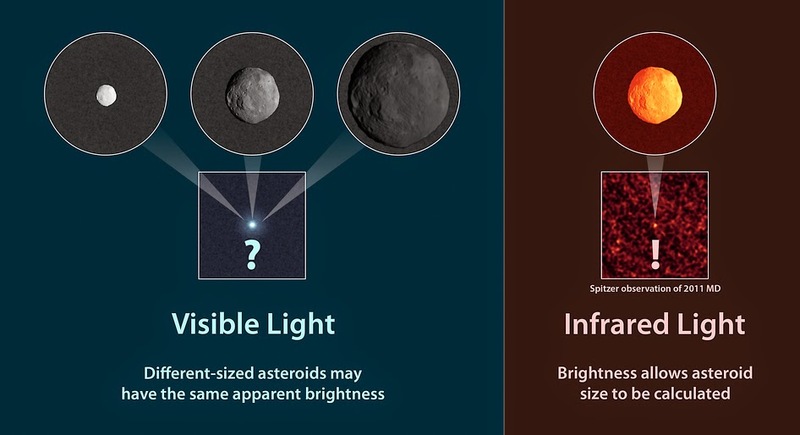 Observations of infrared light coming from asteroids provide a better estimate of their true sizes than visible-light measurements. This diagram illustrates why. The agency will award a total of $4.9 million for concept studies addressing components of ARM. Proposals for the concept studies were solicited through a Broad Agency Announcement (BAA) released in March, and selected in collaboration with NASA's Space Technology and Human Exploration and Operations Mission Directorates. The studies will be completed over a six-month period beginning in July, during which time system concepts and key technologies needed for ARM will be refined and matured. The studies also will include an assessment of the feasibility of potential commercial partners to support the robotic mission. "With these system concept studies, we are taking the next steps to develop capabilities needed to send humans deeper into space than ever before, and ultimately to Mars, while testing new techniques to protect Earth from asteroids," said William Gerstenmaier, associate administrator for NASA's Human Exploration and Operations Mission Directorate. NASA's Spitzer Space Telescope made recent observations of an asteroid, designated 2011 MD, which bears the characteristics of a good candidate for the full capture concept. While NASA will continue to look for other candidate asteroids during the next few years as the mission develops, astronomers are making progress to find suitable candidate asteroids for humanity’s next destination into the solar system. "Observing these elusive remnants that may date from the formation of our solar system as they come close to Earth, is expanding our understanding of our world and the space it resides in," said John Grunsfeld, associate administrator for NASA's Science Mission Directorate. "Closer study of these objects challenge our capabilities for future exploration and will help us test ways to protect our planet from impact. The Spitzer observatory is one of our tools to identify and characterize potential candidate targets for the asteroid mission." Analysis of Spitzer’s infrared data show 2011 MD is roughly 20 feet (6 meters) in size and has a remarkably low density -- about the same as water, which supports the analysis of observations taken in 2011. The asteroid appears to have a structure perhaps resembling a pile of rocks, or a "rubble pile." Since solid rock is about three times as dense as water, this suggests about two-thirds of the asteroid must be empty space. The research team behind the observation says the asteroid could be a collection of small rocks, held loosely together by gravity, or it may be one solid rock with a surrounding halo of small particles. In both cases, the asteroid mass could be captured by the ARM capture mechanism and redirected into lunar orbit. 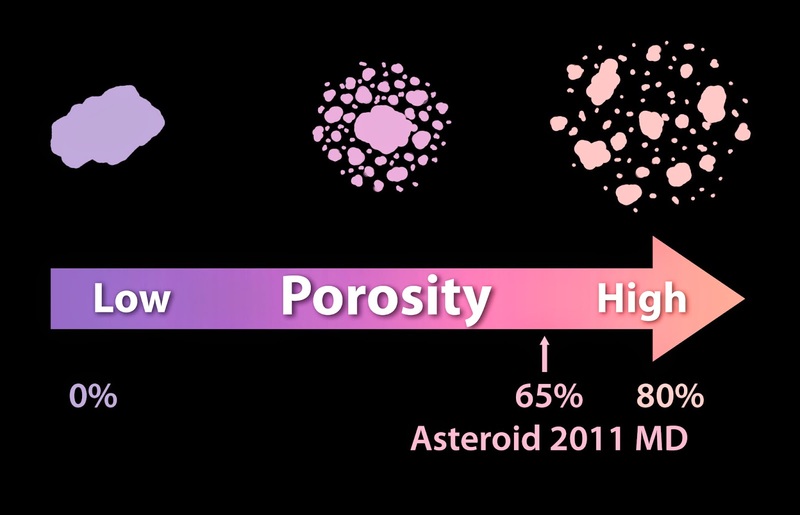 Asteroids can differ in the degree of porosity, or the amount of empty space that makes up their structures. At one end of the spectrum is a single solid rock and, at the other end, is a pile of rubble held together by gravity. To date, nine asteroids have been identified as potential candidates for the mission, having favorable orbits and measuring the right size for the ARM full capture option. With these Spitzer findings on 2011 MD, sizes now have been established for three of the nine candidates. Another asteroid -- 2008 HU4 -- will pass close enough to Earth in 2016 for interplanetary radar to determine some of its characteristics, such as size, shape and rotation. The other five will not get close enough to be observed again before the final mission selection, but NASA’s Near-Earth Objects (NEO) Program is finding several potential candidate asteroids per year. One or two of these get close enough to Earth each year to be well characterized. Boulders have been directly imaged on all larger asteroids visited by spacecraft so far, making retrieval of a large boulder a viable concept for ARM. During the next few years, NASA expects to add several candidates for this option, including asteroid Bennu, which will be imaged up close by the agency's Origins-Spectral Interpretation-Resource Identification-Security-Regolith Explorer (OSIRIS-REx) mission in 2018. "There are great ways for the public to help with our work to identify potentially hazardous asteroids," said Jason Kessler, program executive for NASA’s Asteroid Grand Challenge. "By tapping into the innovative spirit of people around the world, new public-private partnerships can help make Earth a safer place, and perhaps even provide valuable information about the asteroid that astronauts will visit." 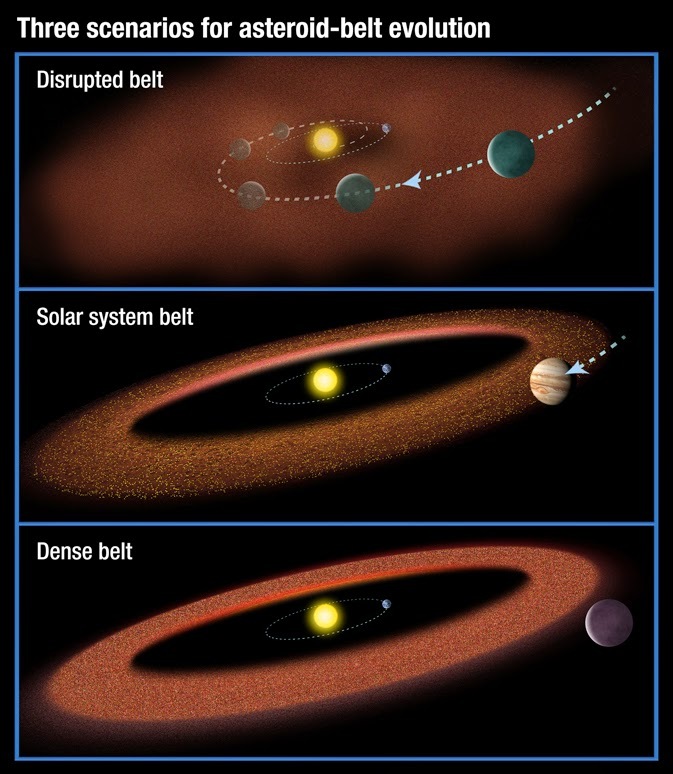 The inner Solar System, from the Sun to Jupiter. 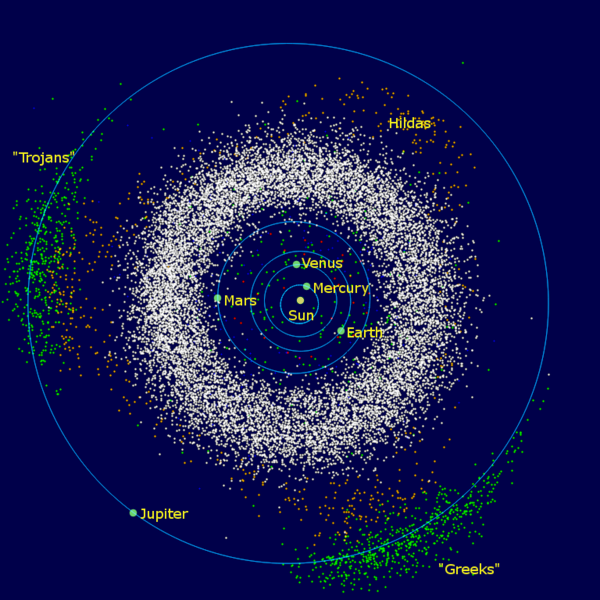 Also includes the asteroid belt (the white donut-shaped cloud), the Hildas (the orange "triangle" just inside the orbit of Jupiter), the Jupiter trojans (green), and the near-Earth asteroids. The group that leads Jupiter are called the "Greeks" and the trailing group are called the "Trojans"